Two great products for keeping marine toilets sanitary that have received Raritan recommendations are now available as a two-pack unit. Boatersland has the Raritan Potty Pack consisting of C.P. Cleans Potties and K.O. Kills Odors for one low price. 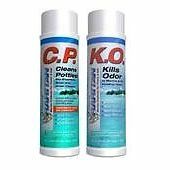 Each product comes in a 22 ounce bottle and each highly-acclaimed product will keep your boat?s toilet clean and odor free. Each product is easy to use and both are environmentally friendly. Boatersland has a large inventory of Raritan products that are designed to keep your marine toilets clean.